Melody & Mist: "La baronne de Crussol" By ~ Elisabeth Vigee Le Brun ~ 1755 - 1842. "La baronne de Crussol" By ~ Elisabeth Vigee Le Brun ~ 1755 - 1842. Marie Louise Elisabeth Vigee, better known under her married name of Le Brun, and generally spoken of as Madame Elisabeth Vigee Le Brun, was born in Paris on April 16, 1755. Her father, Louis Vigee, was a pastel painter of moderate talent, devoted to his art and always ready to commend and encourage his daughter's talent. 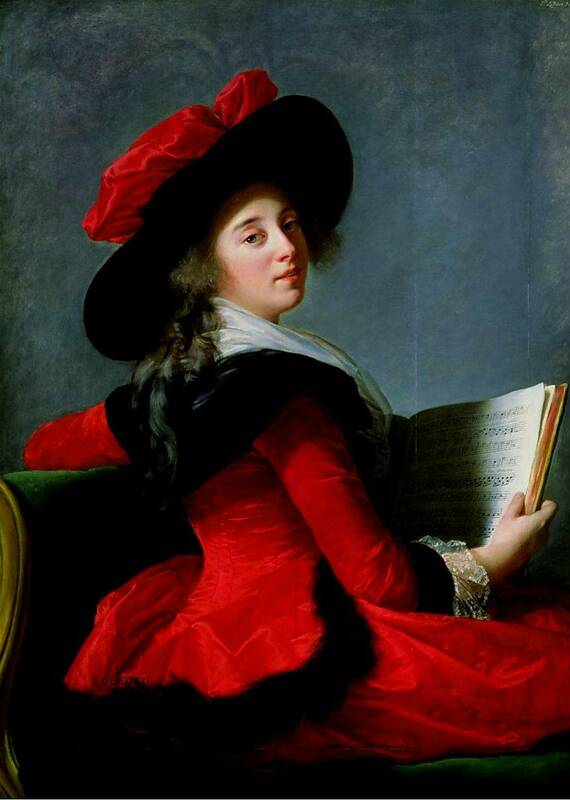 In those 'Souvenirs' in which Madame Vigee Le Brun has recorded the incidents of her life, she tells us that her love for painting bad already declared itself when, as a child of six, she was sent to a convent school, where she was in constant disgrace with her teachers because she decorated her copy books and those of her schoolmates, and even the walls of the dormitory, with faces and landscapes in colored chalks. On one occasion, when at home on a holiday, she drew by lamplight a vigorous little sketch of the bead of a man, which so delighted her father that he exclaimed, "You will be a painter, my child, if ever there was one" These words Elisabeth Vigee never forgot, and that childish drawing, made when she was but seven or eight years old, was cherished by her as long' as she lived. Labels: Elisabeth Vigee Le Brun ~ 1755 - 1842. ~ La baronne de Crussol.